On their turn, a player can move their troop figure up to 2 spaces and take 1 action, in any order. 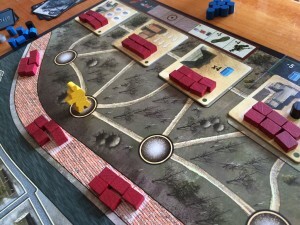 As an action, a player on one of the 6 building tiles can use the building’s power to do things such as gaining ammo, planting a land mine for the enemy to trip, fire a mortar (doing 2 damage to an enemy anywhere on the board), move some enemy units backwards, raise morale, or add 2 bricks to one area. (The mortars, mines and bricks are limited in number.) 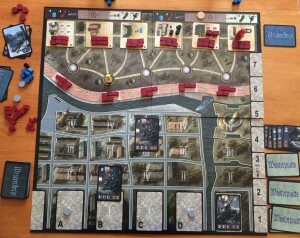 Alternatively, a player on one of the 5 spaces near the river can use their action to spend 1 ammunition to inflict 1 damage on an enemy troop, if there is one in the same column as the player. If other players are on the space, they can combine fire and also each spend 1 ammunition each to inflict 1 damage each too – this is very handy as tougher enemies appear. The reason to use these actions is because the enemy is advancing on the Polish from the area across the river. After any player has taken their turn, any German machine gun units that have advanced to be adjacent to the river, plus any howitzers on the board, inflict damage on the Polish defences in their column (as the Germans appear on the board in 5 columns: A – E). Each space by the river on the players’ side and each building tile, starts with 6 bricks and these get removed as the Germans cause damage. If a space by the river is damaged once its wall has been removed, then the damage removes one brick from one of the 2 building tiles connected to that space. After attacks are resolved, a new German attack card is drawn – if it is a machine gun unit or howitzer, it is placed on the board in the first available column starting at the column shown on the card. If all the columns contain a troop card, the players’ morale goes down 1 step (which can be much worse than it sounds) and the card goes back under the attack deck. An attack card can also be an air raid or morale card and these lower morale and can remove defensive bricks. Finally, each card drawn also states two columns and any machine gun units in those columns advance the number of steps equal to their speed. As the game progresses, any destroyed enemy unit cards (and any air raid and morale attack cards), are placed next to the board. When 8 are piled up, the current day ends, an event card is drawn (which can be good or bad), and the next day starts. The game immediately ends in a loss for the players if the walls in front of any 2 building tiles have lost all of their bricks. The players win if they can reach the end of the 7th day without losing. 7 Days of Westerplatte is a simple, cooperative game which moves along quickly as each turn is short and easy to resolve. It seems simple to start with but, as you would hope from a co-operative game, the choices can be very tricky as you need to achieve too many things with too few actions – so, you’re often faced with which item to allow to get worse, rather than choose which item to get better. Defeating the enemies is the focus but managing the morale track is essential. As morale goes down, players suffer penalties, such as losing one of the mortar shots, or players can only move 1 space for the next 4 turns, or they must discard 5 ammo. One building action raises morale by 1 step (or brings it back to centre if it is below the centre). If pushed high enough, morale can give some positives such as faster movement, or even a double action; however, this is difficult to achieve and reduces focus on combating the enemy. The game starts with up to 3 enemies on the board, and it’s important to keep removing these. This is not easy though as it’s hard to continuously destroy 1 unit every turn because eventually you need spend actions to get more ammo or raise morale, and some enemies requires multiple hits. Whilst not all enemy cards are troops (so don’t get placed on the board), they’re all negative and it’s a struggle to stop the columns from filling up because you draw an enemy card after every player turn. If the columns fill up so new enemy units can’t be placed, morale can start going down quickly – getting out of this cycle is tough because it’s hard to gain ammo quickly enough and destroy units before low morale causes ammo loss. As a result, your situation is almost certainly going to deteriorate and the game is about holding on for long enough. Bricks start to get removed as enemies attack – some enemies do more than 1 damage each time (and some require up to 3 hits to destroy them), so you need to spread out the inevitable damage to last as long as you can. Using an action to move enemies back (so machine guns can’t fire because they’re not next to the river) is very useful, but this doesn’t remove any so it’s a balance between preventing damage and risking lower morale as the columns fill up. Combined fire is a very handy tool, as it allows you to remove tougher enemies quickly, but it requires co-ordination and also having the ammo required. The game has three difficulty settings as the special buildings have an easy and a difficult side – the difficult sides give you fewer resources – plus there are easy and difficult morale tracks (the only difference being one extra space on the easier track before penalties start occurring). Potentially, you could play with a mix of these too. There’s not much scaling based on the number of players (1 fewer enemy cards at start in a 1- or 2-player game ). However, I think having 4 troops or just 2 is just different, rather than easier of harder, as lots of troops allow you to cover more of the board but at the cost of being able to concentrate your effort as their turns are more spread out. There’s some variety in replay due to the special building tiles being randomly placed, and the enemies and events appear are drawn in random order; however, the decisions feel quite similar each game (especially once the mortars, land mines and extra bricks are gone so those buildings don’t do anything) which means there may not be enough variety in the long-term. I think more variety could have been included by adding a few more building tiles, so different mixtures could have been used each game which would change the decisions required. Plus, there could be more variety in the event cards, and the pace could be given ore variety with some attack cards having positive effects to give the players a slight respite (although maybe at a cost so the players can decide to pay it or not). Th attack deck could have contained some special events which get resolved a few turns after they appear, giving players a chance to react to them. Overall, I enjoyed 7 Days of Westerplatte. I like the theme as this event in history is an important moment and the game achieves its intent of marking, and raising awareness about, it. Concerns about long-term variety in replayability aside, the game mechanics are simple which keeps it flowing, difficult choices are required, and it delivers tension (which all co-operative games should). 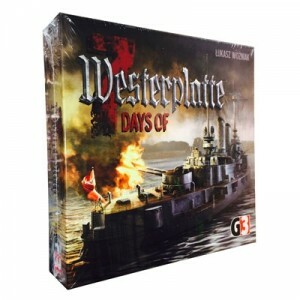 This entry was posted on Tuesday, March 24th, 2015 at 12:55 pm	and is filed under 7 Days of Westerplatte, Board Game Review, Board Games. You can follow any responses to this entry through the RSS 2.0 feed. You can leave a response, or trackback from your own site.